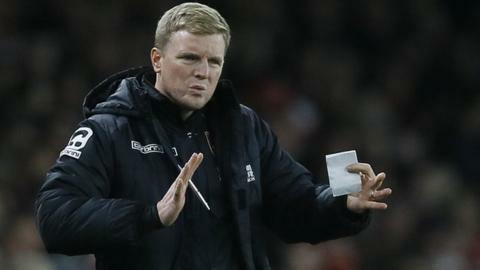 Bournemouth manager Eddie Howe says the club's spending in the transfer market "is not a comfortable feeling" for him. The Cherries have spent £16m on strikers Benik Afobe and Lewis Grabban as they fight for top-flight survival. Howe was in charge of the club when they almost went out of business in 2008 and were given a transfer embargo. "To think in a few years' time you would have been spending millions of pounds on players would not have seemed possible," he said. "I take every penny we spend very seriously as well as the responsibility which comes with that, and try to make good decisions for the football club, not just for now, but for the long term. "It is important that we look beyond this season as it is not just about the here and now, and hopefully we get the major decisions right." Afobe, 22, is believed to have cost £9m from Wolves, while 27-year-old Grabban re-signed for the club from Norwich City for a fee of about £7m - 18 months after Bournemouth sold him to the Canaries for less than half that. Bournemouth have also signed fellow forward Juan Iturbe on loan from Roma in the January transfer window. Afobe started and the other two players came on as substitutes in a 3-1 defeat by West Ham following their moves. "I thought Benik played well," added Howe. "It is very difficult when you come into a new club especially with no training time behind him, but he worked incredibly hard and held the ball up very well in the first half. "He had the two chances and, although he didn't take them, it is great that he was in the right positions and that is a sign of a good striker."